"Start Your Own Custom Training and Management System." Are you spending more and more on training and getting less and less in return? Everyone wants to automate their company’s training program to take advantage of the latest technology. But let’s be honest. It’s hard to justify price tags that run into six figures for training software that may or may not provide a stable, comprehensive learning environment. Discover the proven, streamlined online training service that key training managers are turning to for rapid course development and reliable delivery and tracking. Introducing Private Training Centers, an online service that utilizes interactivity and multimedia to provide a pleasant learning experience. Take a Quick Tour. Your own secure training center is available 24 hours a day for you and your learning audience. Each training center comes complete with its own secure manager and student menus, a simplified, template-based authoring environment, and a robust set of reporting and analysis tools. You’ll have complete control of training policies and user-selectable options for your private center. Most training departments have a collection of PowerPoint presentations, text documents, images, charts, and possibly videos that are used in classroom or ad-hoc training. You can use these same materials to launch new courses in your new online private training center. Alternatively, you may choose to author courses quickly from scratch. You can also easily add learner exercises, automated tests, and skill groups – use full features for enhancing knowledge transfer, assessing the effectiveness of the training, and tracking progress against targets that you set. Your private training center can handle 100 learners as well as 100,000. Whether you are a small startup or department manager, or an executive planning an enterprise-wide training initiative, you’ll have all the tools you need to be successful. Private Training Centers provides each subscriber with a complete, robust training system, which has been used to train over a million online learners. With no software to install and no server to manage, you can begin to add or import users on day one, and to build courses immediately using our built-in templates. All subscribers are provided with their own copy of the latest version of our Training Management System. Many subscribers start delivering core courses right away and add more complex courses to their catalog as those courses are ready. It’s your choice. Our maintenance-free solution lets you focus on your curriculum and the progress of your learners. Your point-and-click menus put you in control and yield instant analysis reports and summaries. One manager can monitor training for hundreds, even thousands, of students. No software or hardware purchase is ever necessary. Your private training center is waiting for you, at a surprisingly low monthly fee of around $1 per student for 1000 users. Higher or lower user levels are adjusted accordingly. And you can cancel at the end of any subscription period, simply by notifying us. Online training doesn’t have to be complicated, and it doesn’t have to be expensive. 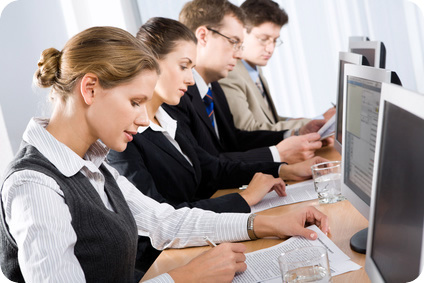 We used the training management system provided by FlexTraining to develop our online courses.